Unified Communications | 8x8, Inc.
8x8 connects teams like never before. Our Unified Communications Suite supports a diverse range of business applications and powers truly global collaboration, in real-time. Our intuitive communication tools offer a best in class user experience for audio conferencing, web conferencing, virtual meetings, screen sharing and more—all on one secure platform. X Series is your all-in-one collaboration solution. Easily navigate between communication channels and take advantage of our industry leading presence and routing tools. The X Series is built to scale with your business needs. Integrate a call center, streamline your call handling, or incorporate social channels with your existing messaging solutions. You find the opportunity- we find the solution.Transform your collaboration. 8x8 lets your teams communicate instantly and naturally. Our unified messaging platform is designed for fast, productive sharing across desktop and mobile devices. Easily insert document, sync with your existing G Suite profiles, and even incorporate your existing conferencing and messaging apps like Skype and Google Chat. Start Sharing Like a Pro. 8x8 is a pioneer in virtual meetings and video conferencing. With our Web Conferencing tools you and your team can host meetings with up to 100 participants, all in HD, all with integrations across your existing communications channels. In Person, Everywhere. What is Unified Communications as a Service (UCaaS)? Unified Communications as a Service (UCaaS) delivers synchronized business communications technologies on one cloud-based platform. UCaaS service providers utilize voice over internet protocol (VOIP) and related IP telephony technology to connect traditional business phone systems with instant messaging, video conferencing and related web services. The enterprise communication advantages of UCaaS include improved collaboration across teams, quick deployment, scalability, and a reduced total cost of ownership. What differentiates 8x8’s services from other unified communications providers? According to Gartner: our industry leadership. For the seventh year in a row, the distinguished industry research firm has named 8x8 a market leader in its special report, “Magic Quadrant for Unified Communications as a Service (UCaaS) Worldwide,” based on the completeness of our vision and our proven ability to execute. As you grow, your 8x8 unified communication system will too. Our cloud services let you customize your communication tools to fit your unique business processes and delivery models. Different teams have different needs; our mission is to empower you to make the right call. Our Unified Communications Suite is simple to manage and fast to deploy. You have full control over your entire unified communication system. You and your teams can customize personal interfaces and prioritize the tools you use most — all without IT assistance. 8x8 can cut phone costs by 50% or more. Our communication systems eliminate the high operating costs and continued capital expenses of old technology. With the 8x8 Unified Communications Suite, you get one vendor with one low monthly payment. Learn more about the 8x8 Advantage and your expected ROI. Markets and teams are global. Keep your workforce and business goals aligned with collaboration solutions that empower everyone, everywhere, every time. 8x8 unites people and locations. Give remote team members, road warriors, and on-premise employees the same seamless access to phone services, conferencing capabilities, integrated mobile apps, analytics, and preferred Customer Relationship Management (CRM) tools - all with built-in time management bonuses like presence awareness and visual voicemail. 8x8 is the only cloud-based unified communications provider that integrates with your contact center. Connect with every customer, every time, using the methods they prefer on our multi-channel contact center tools for small businesses to enterprise clients. 8x8’s global network of secure data centers delivers 99.9999% uptime with built-in redundancy and no single point of failure. Our mission is to be the most reliable cloud-based communication provider on the market. 8x8 built our communication tools from the ground up. We’ve been industry leaders in designing for mobile integration, desktop sharing, virtual meetings and and more. Our commitment to innovation has helped multiple industries ensure business continuity through periods of digital transformation. 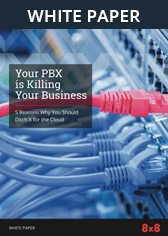 So whether you have private branch exchange (PBX) questions or wonder about our SIP trunking functionality - we’ve got answers. 8x8 takes the security of your data and your teams personally. Our Unified Communications Suite is certified for more security and privacy uses than every competitor in the market. We are FISMA and HIPAA compliant, making our tools the top choice for government services and health care providers, and our solutions are rated Enterprise-Ready by the prestigious Skyhigh Networks CloudTrust™ program.